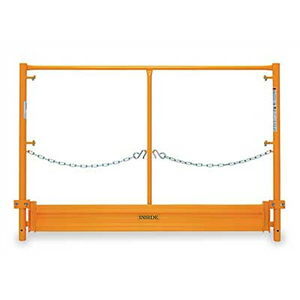 Easi Guard safety rail set for 5' x 7' scaffold includes 2 5' end panels and 2 7' side rails. Guard rail is always recommended and may be required by OSHA if set height exceeds 10'. Check local OSHA requirement before erecting. * Please call us for any questions on our scaffold guardrail set 5 foot x7 foot 4 pcs rentals in Portland OR, Gresham OR, Milwaukee OR, and surrounding metro area.